Last week, I received a green bulb and a purple bulb without tops. I’m guessing in the wintertime the tops don’t grow so well. 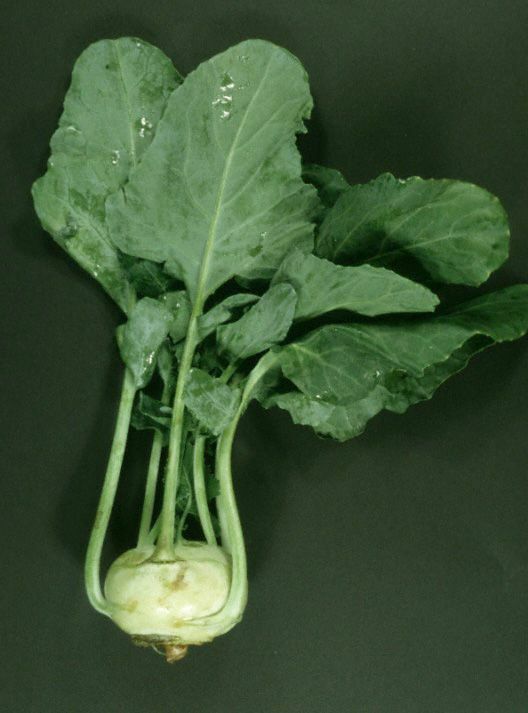 Normally, I would dice kohlrabi and use it in stir-fries and casseroles. 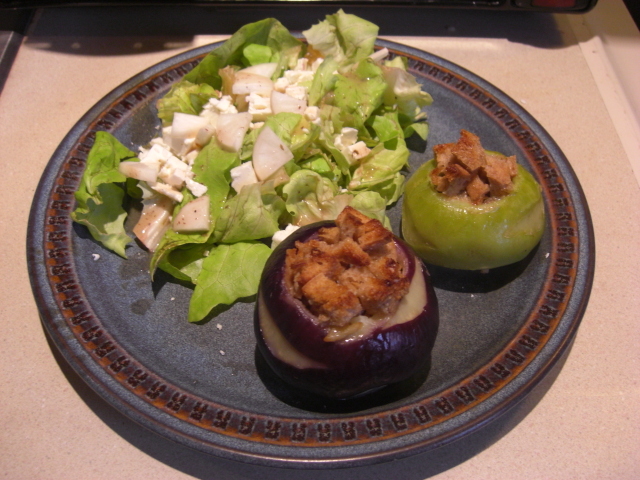 Today, however, I tried stuffing the bulbs as suggested in this kohlrabi recipe. 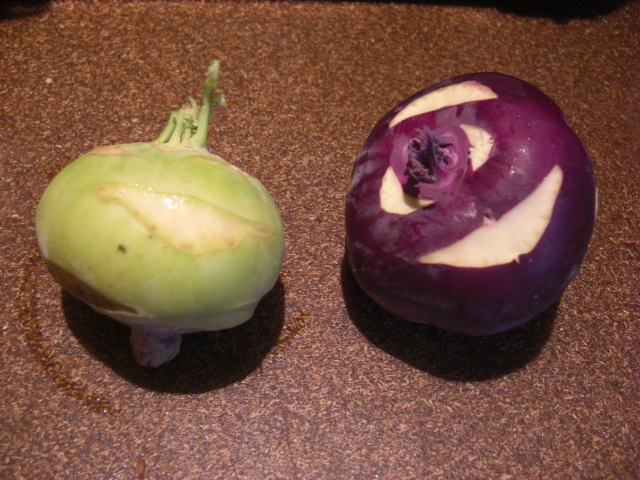 Basically, you scoop out the centers of the kohlrabi and steam the hollow bulbs. While they’re steaming, you make a sausage hash. 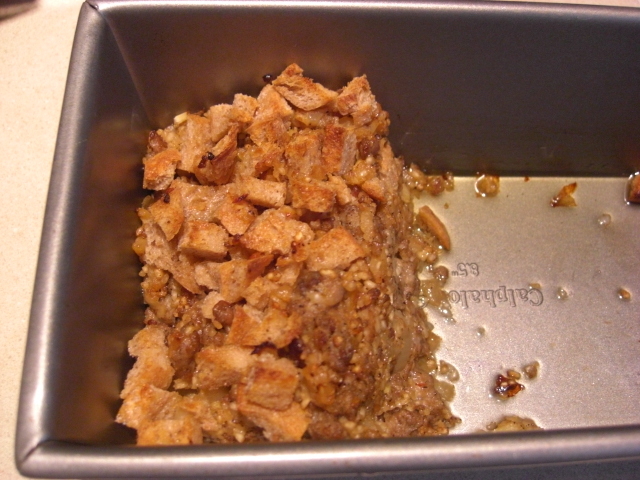 Finally, you stuff the hash in the steamed bulbs, top with bread crumbs, and stick them under the broiler for a few minutes. Scooping out the centers of the kohlrabi with a melon baller was easier than I expected. 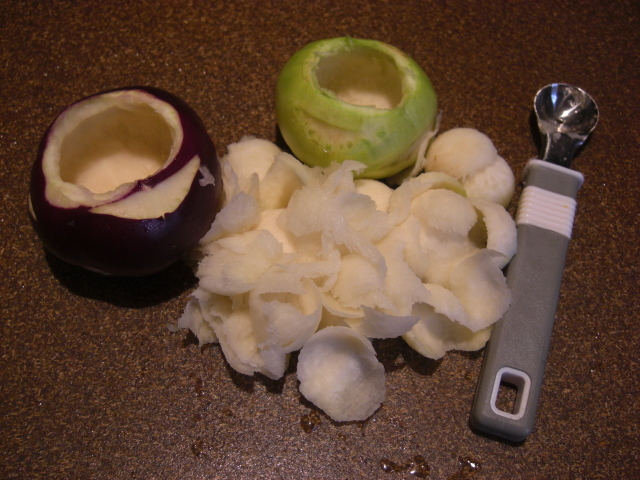 The kohlrabi are solid, so there’s little danger of scooping too much away and having the outside break or collapse. I steamed the hollow bulbs for about 20 minutes. They were done faster than the recipe suggested probably due to their relatively small size. 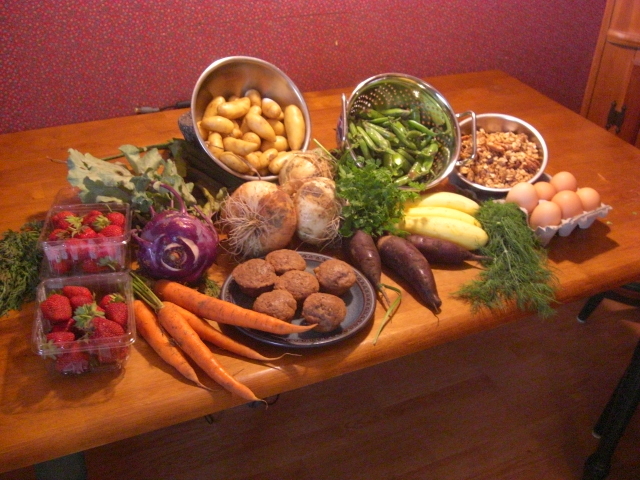 While the bulbs were steaming, I got to chopping produce and defrosting Gum Creek sausage for the hash. 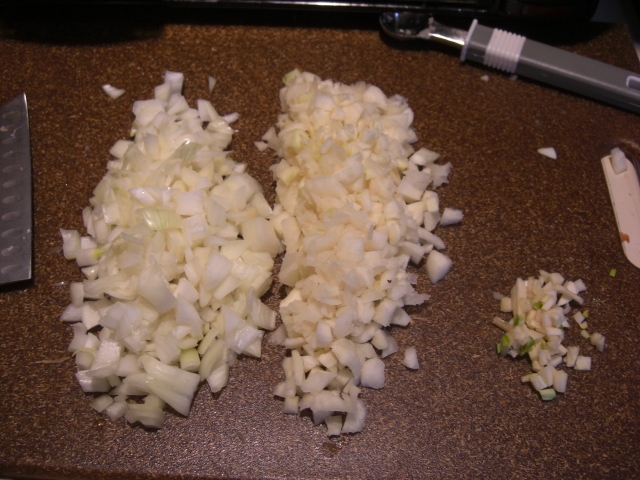 The recipe called for using the kohlrabi greens, but missing those, I just added the scooped out parts of the kohlrabi bulbs along with the onions and garlic. And I didn’t have any rice, so I used corn grits. I considered using the vegetable broth from last week’s delivery, too, to make this meal almost entirely “out of the box.” In the end, however, I decided to use the chicken stock I made several days ago. The hash turned out great. Here’s a steamy pic. The salad is local lettuce and sliced Asian turnips plus some feta cheese. I had extra hash and bread crumbs, so I put both back under the broiler minus the kohlrabi casings. The verdict? I loved the hash with the grits, and kohlrabi has nice flavor that only needs a little salt and pepper to make it sing. However, the whole stuffing part seems kind of silly. 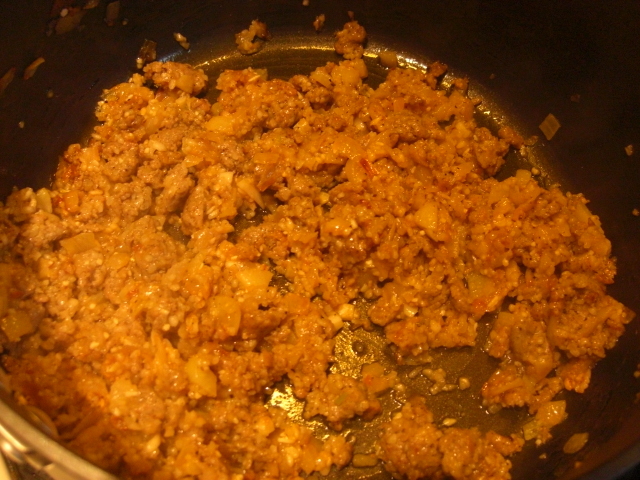 Given the same ingredients again, I would chop the entire bulbs and simply make a hash, top it with breadcrumbs, and put it under the broiler. No muss, no fuss, and two happy winter lunch campers.